This image is one of the latest news releases from the VLT or Very Large Telescope which is operated by the European Southern observatory. This is the Prawn Nebula located 6,000 light years from Earth in the constellation of Scorpius. This is a star forming region with heavy amounts of gas and dust that are being condensed into new stars as well as planets. What causes these clouds to glow is the ultraviolet light that is given off from the stars. The radiation strips the electrons from the hydrogen atoms, then later recombines and emits the bright light you see here. The Prawn nebula is 250 light years across or 4 times the size of a full moon in our sky. 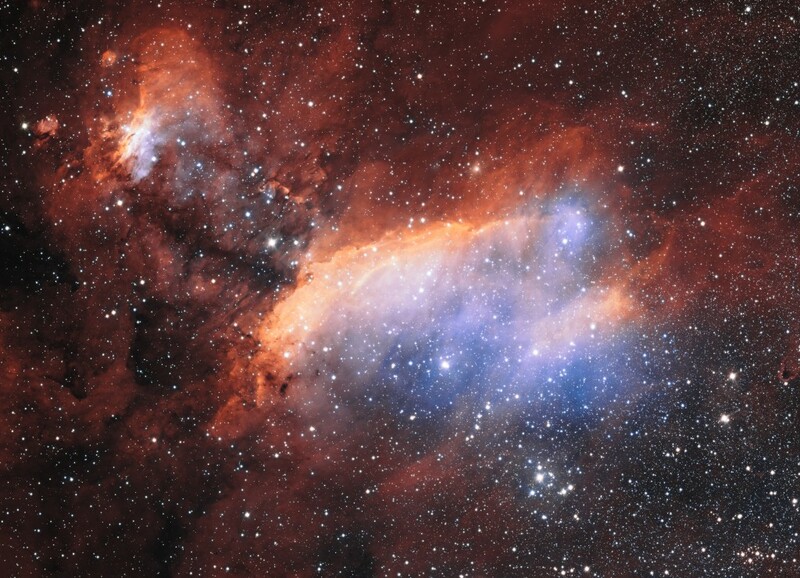 The Prawn Nebula is also located within our Milky Way. The VLT is supported by 15 countries and has been focusing on studying nebula’s within the Milky Way. The Prawn Nebula has been churning and burning new stars for millions of years and the VLT is watching it happen and studying these star formations. With understanding this process this will help us understand more about the universe. For more information you can check out the official press release here.